Previous PostBook Review: The Ryn (Eyes of E’veria, Book 1)Next PostCan Suicide Separate Us From God? I bought mine! Cant wait to read it. Probably be able to start it tomorrow. I’m proofing my ARC today! I can’t wait to read this. I’m rereading “Daughter of Light” so that I’ll remember everything more clearly. It’s been awhile since I’ve read it. This way the story will continue without pause. Is there going to be a third book in the series? The synopsis above is so very good! Wishing now I had a kindle. Have to wait til my order from MLP comes.So proud of you,Morgan! I enjoyed reading it and I’m looking forward to reading Son of Truth and reviewing it as well. I just got my copy of Son of Truth today in the mail. I’m looking forward to reading and reviewing it for my blog. Good luck and much success! I enjoyed reading Daughter of Light and I’m looking forward to reading Son of Truth and reviewing it as well. 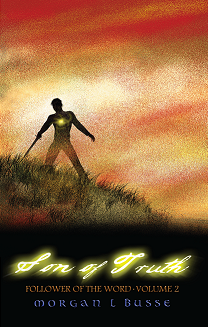 Hi Morgan, I read “Daughter of Light” yesterday and “Son of Truth” today, both on Kindle. Wow, thanks Morgan. It’s been a great read so far. You’ve created characters we can care about and also you’ve woven a good yarn that leads one to want to know what happens next in these characters’ lives. More than that, the books stir in one the desire to know “the Word” for oneself in a deeper way as the characters are growing to. I’m looking forward to book three when it comes out. All the best in the Christie Awards. Finished Son of Truth last night, a great read! Just posted my review.